The Greater Pinelands Dulcimer Society was incorporated in 1979, and since then GPDS members have been gathering together regularly to play, to sing and to enjoy traditional music. GPDS is a nonprofit organization. Our goal is to preserve traditional folk music by learning what we can, and sharing what we know. 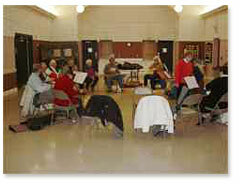 Our members play, teach and perform in order to pass along the folk music tradition. Our membership includes folks of different backgrounds and cultures who share a common bond. We've become an everchanging family of friends linked by the desire to preserve folk instruments, among which the Appalachian mountain and hammered dulcimers stand out. Our extended dulcimer family also includes other well-known instruments, like autoharp, banjo, bozouki, bass fiddle, folk harp, mandolin and penny whistle. When you attend our monthly program meetings and jam sessions, you'll hear a variety of playing styles, from old-time mountain music to Irish jigs and airs. Occasionally, you may hear some classical pieces or a familiar contemporary song. There's also a rich resource of harp tunes dating from the seventeenth century that you may recognize. And, of course, ethnic, religious and gospel tunes are popular, as are the ballads passed on from one generation to the next. We welcome you to join us at our club meetings, programs and jam sessions, regardless of whether or not you play an instrument. Our members include players of varying skill levels, from beginner to advanced, and folks of all ages, from children to senior citizens, with programs that include and appeal to all. We hold our business meetings on the first Tuesday of each month from September through June. 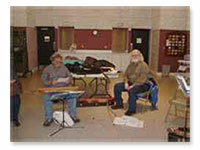 Our meetings are usually brief and are followed by a program or jam session. Occasionally we will sponsor a special event, a performer, pot luck social or an open stage, where all members are invited to perform. Meetings start at 7PM and are held at the Saint Paul Lutheran Church Study House, 910 Marne Highway, Hainesport, NJ 08036. 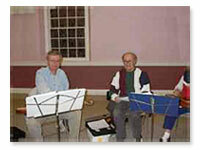 Jam sessions are hosted by members and their families usually on the third Friday of each month at 7PM. All skill levels are welcome to attend. Come to play, sing or listen, but come mostly to have fun. Membership dues are paid annually in January and are $15.00 for an individual, or $25.00 for a family. An individual membership covers one person who is 18 years of age or older. A family membership includes two adults residing in the same household who are 18 years of age or older, and any children under 18 who are residents of the same household. Applicatons are available online, on the GPDS site — www.gpdsonline.com — and copies area available from members and at Pinelands Folk Music & Basketry Center.